And the day after the Haus Khaz rose gardens, we remained on a flower rampage. We headed to the Mughal Gardens, part of the Rashtrapati Bhavan (the President of India's house). This was an amazing place -- a complex of about five gardens laid out in the late 1920s by Edwin Lutyens, who designed most of the "New" infrastructure in New Delhi. The best and biggest garden was like a typical Mughal-style garden, with small streams of water forming a rectangular pattern and meeting near the center. The garden is only open for about 5 weeks of the year, and I was glad we had a chance to go. 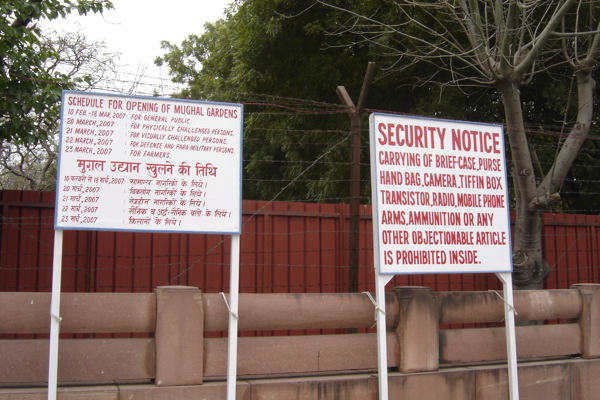 Given its location more or less in the center of India's government, it's wasn't too surprising that security was so tight. And the sign above explains why I don't have any pix of the amazing, huge zinnias, or anything else. The government had put thought into more than just security. There was bottled water available, as well as a handy supply of bathrooms and even "lounges" (covered tents) for getting out of the heat. The lines moved fairly fast when we arrived in mid-morning, but when we left around noon they were much longer. Clearly, visiting the gardens is something that lots of families do as a tradition. But what people evidently don't do is stop and smell the roses -- we got lots of funny looks when we did so. And with rosewater such a common ingredient in desserts as well as perfumes, this seemed especially surprising.